The William Lake Property (WLP) is located in the province of Manitoba, 460 km north of Winnipeg and 250 km south of Thompson. It is adjacent to the north-south road-rail-electrical transmission corridor (Figures 1 & 2). It consists of 107 mineral claims and one exploration license (305.53 km2 in total) along the southern extension of the Thompson Nickel Belt (TNB) underlying younger flat-lying Paleozoic sediments (Figures 2, 3 & 4). Currently the TNB hosts 4 producing world-class magmatic nickel deposits. Proven and probable reserves at the 3 mines owned by Vale (formerly Inco) total 26.1 million tonnes (t) which average 1.72% Ni. At Pure Nickel’s WLP, drilling has returned very attractive Ni grades, 8.47% over 1.42 m, 3.9% over 3.6 m, 2.85% over 6.4 m and 2.05% over 11.2 m. Such higher grade mineralization is locally flanked by lower grade zones from which drill intercepts have been as much as 87.2m averaging 0.7% Ni. Platinum group elements (PGE’s) have been determined in composite core samples from only one of the mineralized zones discovered to date, W22. The composite samples average is 1.69% Ni, 0.10% Cu, 0.02% Co and 0.12 g/t Au. The upper values for PGE’s as determined at the SGS Lakefield laboratory are 9.3 g/t Pt, 11.0g/t Pd, 2.1g/t Rh, 2.9g/t Ir and 10.4g/t Ru. Commercial Ni deposits have been confirmed to occur throughout a northeast-trending, 20km by 330km portion of the boundary zone between the Superior and Churchill geological provinces of the Precambrian Shield in Manitoba. Exploration for nickel in the TNB mining district commenced in 1946 when Inco embarked on a program that led to the discovery of the Thompson deposit in 1956, after 128,748 line-km of airborne magnetic and electromagnetic surveys, 17,703 line-km of ground follow-up geophysics and 155,410m of surface drilling. Discovery of the Thompson deposit led to considerably more drilling (174,433m in 1956-7 alone), the development of a mining-smelting-refining complex and the building of the town of Thompson leading to the start of production in 1961. Since then, an annual output of 50,000 t of nickel cathode has been achieved while maintaining approximately 25 million t of proven and probable reserves. At the current reserve grade of 1.72% Ni, in the order of 175 million t will have been mined since 1961. Other mines in the TNB include Bucko (Crowflight Minerals Inc.), the former Manibridge Mine (Falconbridge Ltd.) and Minago which are located 15 km north-east of the WLP. Victory Nickel Inc. currently plans to develop an open pit mine near here after having completed a definitive feasibility study to extract a measured and indicated resource of 44.1 million tonnes grading 0.43% Ni. Pure Nickel’s WLP property encompasses a portion of the TNB overlain by 70 to 170 metres of flat-lying Palaeozoic sediments. 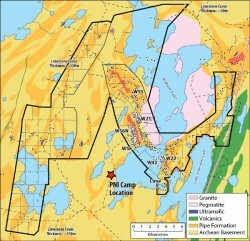 Pure Nickel’s interest in the project area is based on the geological similarity with, and proximity to, the currently productive portion of the TNB, the number of drill intersections with assays equal to or better than the reserve and resource grade at already producing underground mines and the fact that the historical Falconbridge Ltd. holes were too widely spaced to do more than determine which of the chosen geophysical anomalies reflected Ni-bearing sulphides. The Ni deposits currently being mined in the TNB by underground methods are associated with ultramafic bodies and metasediments in the axis of folds and in planes of movement in metamorphosed sulphide iron formations, quartzites, biotitic schist, metamorphosed lime-rich sediments and carbon-rich metamorphosed sediments that host the highest grade ore zones are in the recesses created by structural deformation. To date, Pure Nickel has found Ni-Cu-PGE sulphide mineralization in exactly the same setting within the WLP. From 1989 to 2002, Falconbridge carried out airborne and ground geophysical surveys in the southern TNB, drilled 136,542m (260 holes) of core and made a number of promising Ni discoveries in the area that is now the WLP. Prior to this, there had been sporadic surveys and drilling by various parties. Following acquisition of the WLP from Xstrata in 2007, Pure Nickel carried out a 1,159 line-km, helicopter-borne VTEM geophysical survey, drilled 15 holes for a total of 7,526m, and, in March 2010, carried out a very low frequency TEM ground geophysical survey over the promising W-22 zone. The purpose was to determine whether this would enable detection of deeper and/or stronger conductors than those detected by VTEM or the earlier Falconbridge ground and airborne surveys; the results were positive. Significant Ni-sulphide intersections have been discovered by multiple drill holes by Pure Nickel and predecessors in the following prospect areas along the William Lake trend: W56, W56N, W22, W21, W42, W55, and Lime. The mineralization invariably occurs within or in the vicinity of ultramafic bodies or within iron formations and other sulphide-rich meta-sedimentary rocks and in crosscutting pegmatite dykes. At W56, the best intersections were 8.47% Ni over 1.42m, 6.16% over 1.18m, 2.85% over 6.4m and 2.05% over 11.2m; at W56N, 3.44% Ni over 2.10 m; and, at W22, 1.65% Ni over 15.1m, 1.5% over 9.9m, 0.7% over 73.5m and 3.9% over 3.6m. It was composite samples from W-22 which gave the very encouraging PGE results cited in the summary paragraph. The TEM ground geophysical survey in March 2010 over the W22 area was successful in identifying a strong conductor underlying a weaker conductor that had been detected earlier by VTEM and by Falconbridge surveys. An initial drill target would be this strong conductor. Then, following more extensive TEM surveying, further drilling would target portions of the known zones expected to be better defined by the TEM as to depth, size and configuration.